My idea with this series is to do short reviews on LUSH products, nothing too long as I know you guys also like the shorter type reviews. If you have a specific product you would like me to do a review on, leave me a comment below. You will be feeding my addiction, but I’ll be more than happy to place an order and give the specific product a go! Just a little disclaimer: 1. 99% of the products I will review, were not sent to me by LUSH (a girl can dream though…), so as with all my other reviews, these are my 100% honest opinion. I do love most LUSH products, but there has been 2 specific products so far, that I have not been impressed with (the one was the Marilyn Hair Treatment & perhaps the other one will be my second post in this series). Oh, and 2. There will be a couple of limited edition Christmas collection products in the mix (I went a bit crazy with the Christmas products last year), so just bear in mind that some of them may not be available for purchase right now. 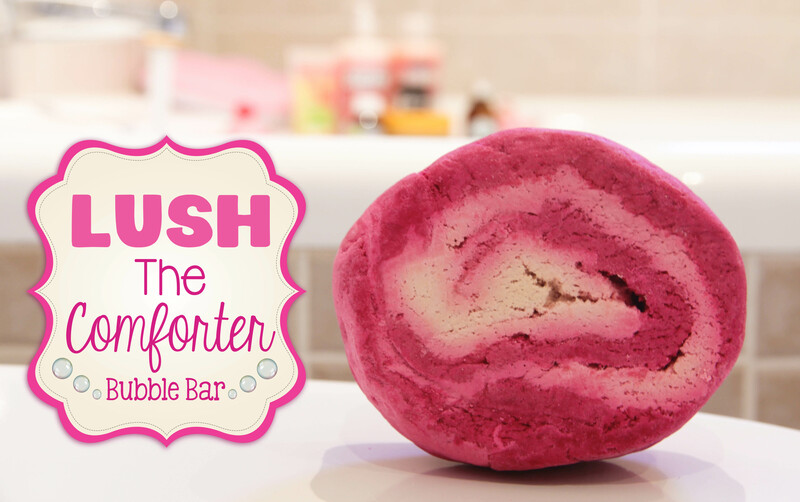 The Comforter is one of LUSH’s best selling bubble bars – if you’re unfamiliar with what a bubble bar is, it’s a solid bar that you crumble under your running bath water and it creates big luscious bubbles. Not just any bubbles, though, LUSH bubbles. There is a difference between your average bubble and a LUSH bubble, a LUSH bubble sounds different when it pops (almost like a cuter, more audible pop) & LUSH bubbles don’t disappear within a couple of minutes. The bubbles are there to stay throughout your bath. You know how some bubbles start to disappear as soon as you start using your soap or shower gel? That’s not the case with the LUSH bubbles, they just keep chilling around you like you guys are BFFs. The scent of The Comforter contains blackcurrant, but to be honest, the scent is more of a sweet mixed fruit scent to me. It turns the bath water into a delightful vibrant pink colour (who doesn’t love taking a PINK bath?) and the scent lingers in the air for quite some time. I find when I use The Comforter, it not only fills our bedroom with it’s wonderful scent, but also the whole upstairs area. The Comforter bubble bar does leave the skin feeling moisturised, but it’s not a bath melt (or something like Butterball), so it’s not super moisturising. But it also doesn’t dry out the skin, like some cheaper bubble baths do. The scent lingers on the skin for a couple of hours and Neal always comments on the way I smell whenever I take a bath with this beauty. The Comforter retails for R 54,50 at LUSH Cavendish Square, LUSH V&A Waterfront and the LUSH SA online store. I know this might sound a bit pricey but this is one of their biggest bath bars and you could easily get 4 to 6 uses out of it. 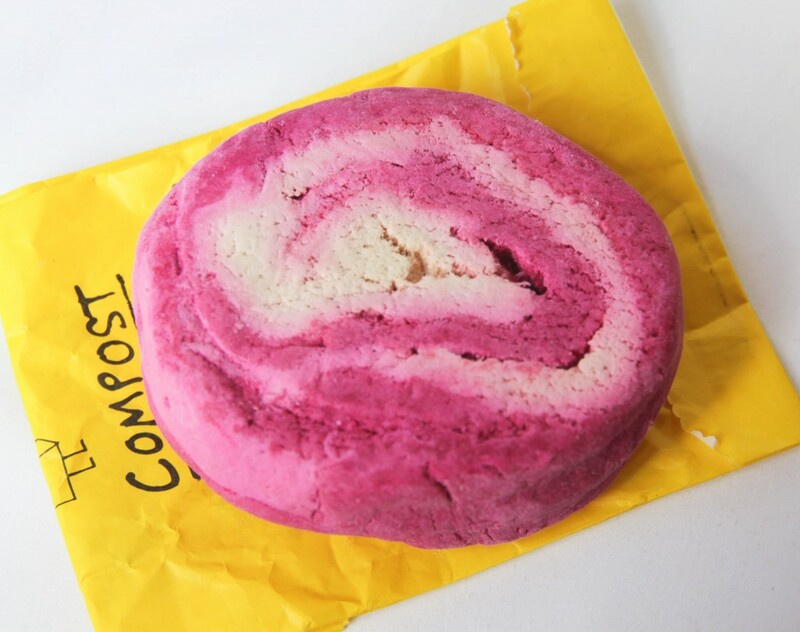 This bubble bar is Vegan & cruelty-free. I use The Comforter when I’ve had a really bad day, and to be honest, it really is comforting (so the name is fitting) and definitely brightens up my day. Have you tried The Comforter? Do you love it as much as I do? As always, your photos are to die for! I havent tried this bubble bar, have tried ballistics and bath melts. Now you have me longing for one of these. Thank you so much, Ronel! 😀 You are too sweet! You have such a lovely bath, I wish I had a bath like that. I have tried this one and I agree, it doesnt smell like blackcurrant at all, it smells like fruity sweets. This is my number 1 fav bath product from Lush. Love this bubble bar from Lush, and I totes agree with you about the bubbles being different to other normal bubbles. You take the best photos, Lu, so clear and interesting. PLEASE do a review on Ultrabland (I have heard so many mixed reviews on this) and Ocean Salt facial scrub. I want to try the Ocean Salt but I’m scared the salt particles are too abrasive and I scrub my face off – lol! I haven’t tried this bubble bar but will defs give it a try next time I do a Lush shop. I’ll be happy to do reviews on those 2 for you, Caryn. Ultrabland is actually the product I was referring to in the beginning of the blog post (one product I’m not raving about at the moment). Luv this new series. Im a proud lush addict too. Sounds so relaxing! I love your bath setup, as you know, I’m not much into taking baths, I prefer showers–but your little setup and reviews on Lush products are so tempting! I may just give you a little list of things I may want to read a review on. Hehe! Perhaps you should start out with something from LUSH that is non-bath-related and ease into things that way… I used to be just like you, I hardly ever took baths. But then when LUSH came along with all their bath bombs and bath melts and bubble bars, I just couldn’t help myself. Once you’ve tried LUSH, you’ll be hooked! I am ashamed to say I have never tried Lush but I am so getting online 2rw and ordering a few bits. I just saw they have their VDay items already.